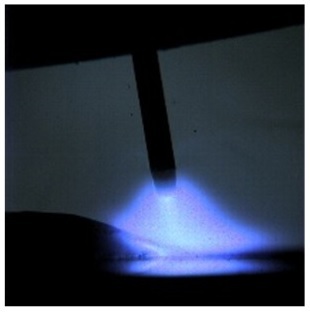 There are only a few welding parameters that directly affect the physics of the welding arc. The welding voltage is one of those parameters. For this reason it is an essential variable in one form or another in most welding codes. In this essay we will look at how the welding voltage is set in different welding processes, and what its effect is in different circumstances. We will also look at how many of the common welding codes deal with the welding voltage as variable. For now, let us assume that we are able to measure the voltage only across the arc, so we will initially just constrain our discussion to this. We will later add a short note on the implications of not being able to isolate our measurements only to the "arc gap". Each type of gas will have a characteristic "resistance" to the flow of these electrons and ions. Principally we can change this resistance by changing the length of the arc. In other words, when a welder increases the arc length, then s/he is effectively increasing the welding voltage. 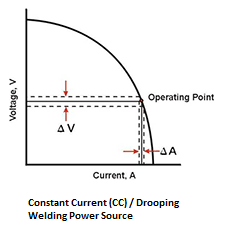 In other words, it is not possible to do much changing of the voltage through the arc length with a CC power source, without leading to welding quality issues, but is note-the-less an important technique for the Welder to use to achieve different weld bead results. In the case of the GMAW process, the transfer mode is an essential variable. 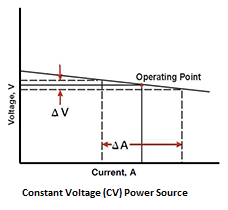 Seeing as the transfer mode is strongly correlated to the voltage, this is again an indirect voltage control. The Australian pressure equipment welding code is AS 3992. It deals with the welding voltage in pretty much the same way as ASME IX, through indirect measures of transfer mode and heat input. The Australian cross country pipeline welding code is AS 2885.2. It deals with the welding voltage in pretty much the same way as ASME IX, through indirect measures of transfer mode and heat input. A widely used subsea pipeline code is DNV-OS-F101. It deals with the welding voltage in pretty much the same way as ASME IX, through indirect measures of transfer mode and heat input. In Europe, the ISO 15614-1 is a common specification used for many different product types. It too controls the voltage indirectly through the heat input and transfer mode variables. The American structural steel welding code is AWS D1.1. It limits the variation in voltage for the SAW, GMAW and FCAW processes to plus or minus 7% of the voltage used in the procedure qualification coupon. It does not limit the voltage for the SMAW and GTAW processes. The Australian structural steel welding code is AS1554.1. It has the same plus minus 7% for the SAW. GMAW and FCAW processes as used in AWS D1.1, but in addition it limits the voltage for the SMAW and GTAW processes to plus minus 15% of that used in the qualification coupon. As mentioned earlier in this article, when we are talking about the welding voltage, then ideally we want to measure it exactly across the arc only. Unfortunately this is rather impractical, as the closer we get to the welding arc, the higher the temperature, so any probe trying to attach at that point will just melt. Any probe attached close to the arc will also get in the way of the Welder. As a result, it is only practical to measure the voltage at points somewhat remote from the welding arc. Most modern welding power sources will have a voltage meter included. In addition to the voltage drop across the arc, this meter is also measuring the voltage drops across both the welding leads, (electrode cable and ground clamp cable) the electrode holder, the electrode and the work piece. As long as the welding leads are relatively short, this voltage reading is not too far off, but for long welding cables, this reading will be significantly higher than the real voltage experienced across the arc. Due to the length restrictions inherent with the feeding tubes of the typical GMAW and FCAW processes, the voltage readings on these machines can usually be relied upon. In the case of the SMAW and GTAW processes, we normally need to try to get closer to the electrode holder and work piece to get good consistent readings. An external volt meter that you can connect close to the electrode holder and work piece is therefore important to obtain good information and consistent control between different welding set-ups for these welding processes.